12 Months Warranty: Return or refund without hassle, please contact us first if you have any question, we can give best service for you, you will not waste your money, we are reliable seller on Amazon. These new Office Chair Wheels are a revolutionary upgrade for the standard office chair. You can experience the best feeling of replacement chair wheels. Gives your old chairs new life upgraded it's performance. Making your chair faster, smoother and quite to roll. The rubber wheels won't scratch wood floor and carpet. Universal Stem Size: 7/16" (11mm) x 7/8" (22mm) fits most office chairs. Heavy Duty casters make the chair is more stable. The Caster Wheels are perfect for schools, classrooms, home and office! Its rugby material will makes the wheels more quiet, it is better for medical office, dental office and home office, especially these families with babies. 100% Purchasing Guarantee: If you are not absolutely LOVE your new casters, contact us for a FREE replacement or request refund. ★ 100% Floor Protection: Say-goodbye to the traditional low quality casters which can destroy your floor. 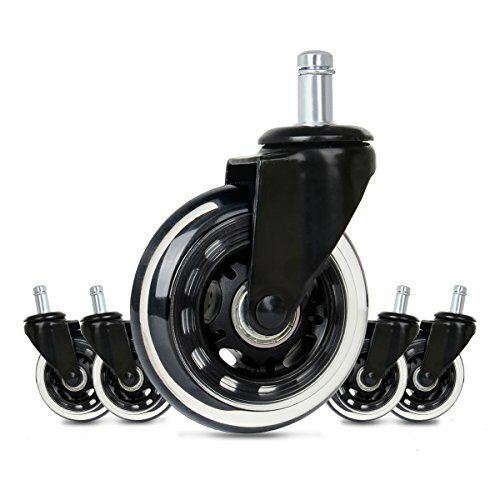 We guarantee that our caster wheels will NEVER damage your wood floor, carpet, tile, concrete or stone! They are soft & strong high grade polyurethane wheels. ★ Heavy Duty: Our high quality steel casters support more combined weight than traditional casters for long lasting endurance & durability. Our rollerblade caster wheels support bracket and internal parts are made of high grade steel and are extremely strong. If you are not absolutely LOVE your new casters, contact us for a FREE replacement! ★ Our Premium Office Chair Caster Wheels apply super high quality ABEC-7 Bearings. Our rollerblade style casters are incased with soft clear polyurethane which guarantees to not leave black marks or scratch up any surface. (We tested them 6 months with the people whose weight is over 200lbs, and they still work great). ★ Smooth and Quiet: Our rollerblade caster wheels support bracket and internal parts are made of high grade steel and are extremely strong. It is super quiet and smooth while rolling, everyone in your home will not be disturbed when you are working. ★ Easy Installation: Without any tool, just pull out the old casters, and push your new ones. Then enjoy your ultra luxurious modern casters. If you have any questions about this product by Cusfull, contact us by completing and submitting the form below. If you are looking for a specif part number, please include it with your message. Miracle Caster! Extra Large Chair Wheels. 4" Set of Five. Great for carpet. Replaces chair mat.